Surrounded by a pine forest the "President Hotel" is indeed unique for its location. Located in the ecological clean district of the Ufa city, the hotel building rising high above the Belaya and the Ufa rivers, gives its guests stunning views and healing microclimate of a coniferous forest. Contemplation of the forest, river curves hiding far beyond the horizon and broad sky gives hotel guests inspiration and tranquility. At the same time it is easy to get to the "President Hotel" - it is just 20 minutes via car from the international airport and 15 minutes from the downtown. 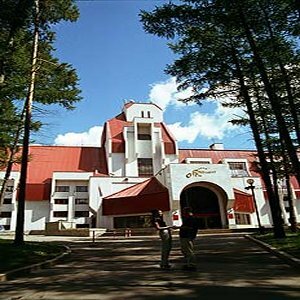 The "President Hotel" nowadays is the largest hotel in the Republic of Bashkortostan, features 237 rooms of different categories. Architectural room solution creates the feeling of space and fullness of light and air. Rooms are equipped with the modern technology and have a panoramic view of confluence of the Belaya and the Ufa rivers. Cable and satellite television is provided including the following channels - the Chinese CCCTV-4, German - DW-TV, French - France 24, English - BBC World News, Tatar - Kurai, Tugan Tel, TNV, Bashkir - BST. Wireless Internet access is provided in all rooms and public zones. The "President Hotel" offers several onsite dining options, such as the "Premier" restaurant, located on the ground floor, serving up European and Russian cuisine, and the "Scrooge Bar" perfect for apres day. The "President Hotel" also offers a wide range of conference facilities: the "Parliament" cogress hall can accommodate for up to 500 people, the "President" conference hall for 300 people, and the "Kantsler" (the "Chancellor") conference hall for 150 people.